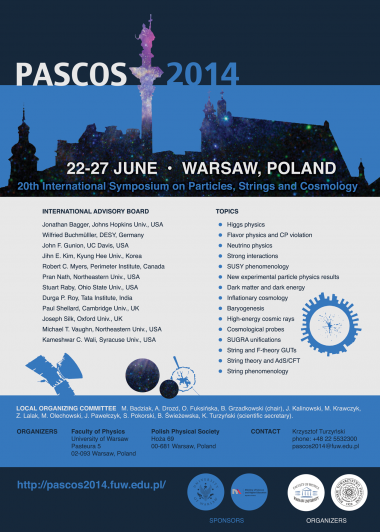 The 20th International Symposium on Particles, Strings and Cosmology, PASCOS 2014 will be organized jointly by the Faculty of Physics, University of Warsaw and the Polish Physical Society. The meeting will be held in Warsaw from 22th till 27th of June. The goal of the symposium is to review and discuss the recent progress in particle physics, string theory and cosmology. Although the meeting is focused at theoretical physics, current experimental results and future experiments will also be discussed. The meeting will take place in the Old Library at the main campus of the University of Warsaw.